I'm just looking to get peoples opinion on brake upgrades that are available for Carrera 3.6's with 19" wheels. I've been looking at whats available for a while now and even ordered a brake kit last week only to be told that it was a 12 week lead time, so cancelled that. I've thought about Giro discs to get to 340mm (compared to my standard 318mm). They seem quite expensive (about £1200 for two discs) and you still end up with the same size pad. I know they will be great quality but still. I don't think there is an OEM larger caliper that fits my hubs (unless somebody can tell me otherwise?) that allows 355mm or larger discs. Would love to be proven wrong on this one. So I've been looking at DesignTek 6 or 8 pot calipers with 355mm or 380mm discs. I think the 6 pots can use Pagid RS29 pads but I'm not sure if Pagid pads fit the 8 pots? But these were on a 3 month lead time. So now I've been asking around trying to find distributors for Eurocup GT calipers (which I suspect are the same thing as DesignTek so I'm hoping they also accept Pagid pads). Has anybody fitted either DesignTek or Eurocup calipers? I don't daily drive my car so I'm not worried about wearing brakes out or squeaky pads. Are you modding for a particular purpose, performance, looks, other? Do the 3.8 brakes not fit? - would have expected some used deals to be available on them, plus plenty of disks and pads available. Where are you based Craig? Still in Scotland? 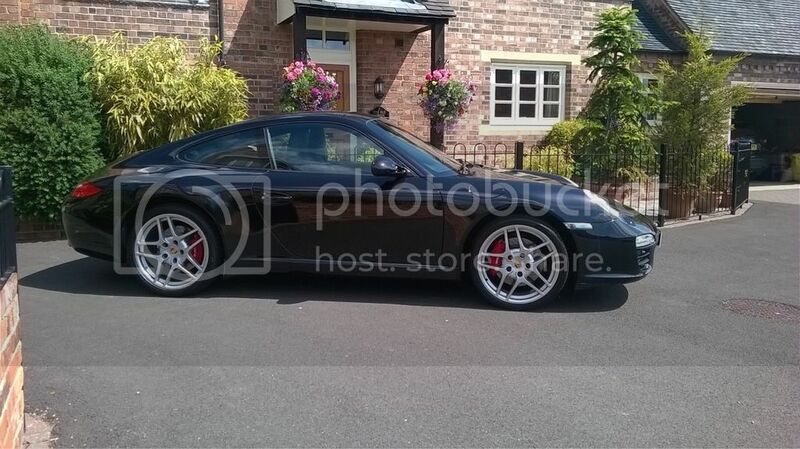 Have a look at mine, not sure if they’re brakes from carrera S fitted to my carrera, or just painted callipers. I’ll measure disc diameter later. Personally I would just upgrade to the Brembo set-up on the Carrera S. They perform well, parts are plentiful and they look good too! Something like this - https://www.ebay.co.uk/itm/911-996-997-Porsche-Calipers-Front-And-Rear-Monoblock-brembo-VW-VAG-AUDI/153326954271? I'm pretty sure 3.8 brakes don't fit. When I first started looking I thought I was onto a winner because I have shiny red calipers and I thought the car had been spec'd with 3.8 brakes, but I've actually only got 'little reds', lol. The 3.6 has calipers with 130mm bolt pitch (same as the 996 I think). The 3.8 has a bolt pitch of 142mm (I think). That'll be why brake kits are advertised as '996 & 997 Carrera 3.4 & 3.6'. So that rules out a good few options. I love the feel of my brakes. They give great modulation hammering into a tight corner. That's what I don't want to ruin. None of the DesignTek or Eurocup suppliers can tell me what the piston diameters are to compare it with my current calipers. When you look at the difference in brake pad area between my calipers (first link below) and the pads that fit the DesignTek 6-pots (second link below) its pretty substantial. This was the consensus on here a few years back when I was looking to upgrade the brakes on my C4S. Could you space out the calliper to put the bigger S discs on from the 3.8? Yip cooling ducts sound good, didn't realise they could be so cheap either, I thought they were £70. Yes, I totally agree with going for better pads. I'm thinking Pagid RS29's, for what ever I do, about £250-278 I think. Hoses, might as well do them too, £79 for Goodridge? NLW73 - Yes I like the idea of spacing out my existing calipers. That's what led me to look at the Giro disc kits. I think they come with a spacer bracket to get to 340mm discs. But £1200 for 2 discs and a couple of brackets.... I'm sure I could draw up my own brackets (I'm a design engineer by trade) but it could end up being a bodge-job challenge, hahaha. I'd rather buy something like that from a reputable company. The other thing I'm not sure about is that the 3.8 discs are 34mm thick and the 3.6 discs are 28mm thick. Would that mean I'd have to sand off 3mm per pad from my expensive new Pagid pads?? Not sure. I've not been able to find a supplier for these spacer brackets unless anybody knows otherwise? I know all you're comments are the logical thing to do but I also know how my brain works, lol. I'd buy standard size Brembo discs and Pagid pads, everything would work great with an improvement over what I've got just now but a couple of months later I'd be wondering if the 6-pots and 355mm discs would be even better but I wouldn't want to throw £434 worth of Brembo's and Pagids in the bin to find out, then I'd be annoyed with myself. please check the price of the cooling ducts at OPC first - there are quite cheap IIRC , less than what some traders on ebay ask. vlad is spot on. don't buy them on ebay as traders are putting mark up. go straight to OPC with these part numbers and prepare to be amazed at the low price! they were £20 for the fronts AND rears when I bought them last year. its a motorsport part so they won't be on the shelf but easy to order in. bolt onto the wishbones the same as you oem ones. if they are still on there as sometimes they come off and that does not help braking and cooling too. you might as well chuck the rear ones on as well as for £20 you can't go wrong fella!! yes pagid are a good option and RS29s are superb. together with braided hoses it should make a big change. Great tip on GT3 cooling ducts, Thanks NLW! Has anyone noticed a difference after fitting braided hoses? OE hoses are braided internally, so surely it is just cosmetic? I’m due a brake fluid change in coming months, and planning my first track time at a Donington evening session. I have standard c2 ‘small reds’ same is OP. Unless you have a problem with your brake lines you won't notice the change to braided lines. Great information on the cooling ducts! Quick update from me. Against all you're logical and sound advice I decided to order a set of the Eurocup GT brakes. Before I ordered them I asked what the caliper piston diameters are but they couldn't tell me, only that the kit is plug-and-play for my car. After I had ordered them and then heard nothing for a week I was starting to doubt my decision and wanted to get the technical specs of what I was buying. The supplier then managed to tell me the piston diameters and surprise surprise when you do the calcs they require 30% more fluid than my current 4-pot calipers. So I cancelled them. I'm now talking to HiSpec Brakes who sound much more on the ball. Lots of options to look at. I'll let you know how I get on. Can someone confirm the brake fluid capacity of a 997.2? Do I need 1L or 1.5L or 2L? Just about to order some Motul DOT5.1 from Opie along with Millers oil for my next service.